“Sunset”, oil on board, 12” x 9”, signed and dated 1918 lower left. Born/lived: Born in Madison, NJ and lived in New York and Providence Rhode Island. Known: as a painter of landscapes, marine and nocturne paintings. 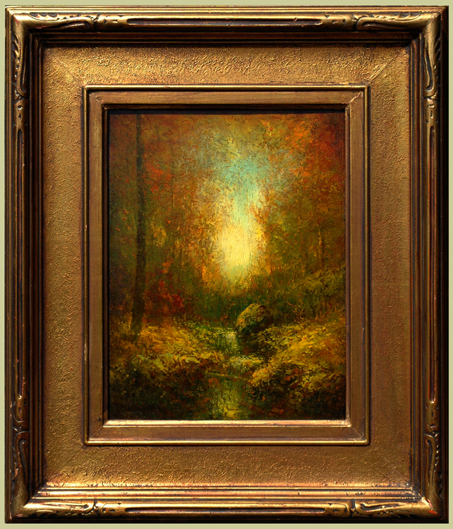 His paintings were often dark, evening landscapes similar in style to those of Ralph Blakelock, with whom he painted. Member: Society of Independent Artists. Exhibited: Society of Independent Artists, Philadelphia Galleries – Feb 1917; Brooklyn Society of Artists, the Red Cross Exhibition – Oct 1917 (aka the International Studio); Inaugural Exhibition of the Butler Art Institute – 1918-19; Young’s Galleries of Chicago – 1918; Canadian Club of NYC – 1924; and the Society of Independent Artists – 1924. Work: museum collections: Philbrook Art Museum, Tulsa, OK; Michigan University Museum of Art; Smithsonian American Art Museum; and Hibbing Library Collection – Hibbing, MN. Publications: Beyond Madness – The Art of Ralph Blakelock: 1847-1919 (2007) by Norman Geske; The Artists’ Bluebook (2005) by Lonnie Pierson Dunbier; The Unknown Night: The Madness and Genius of R. A. Blakelock (2003) by Glyn Vincent; Who Was Who in American Art, 1564-1975 (1999) by Peter Hastings Falk; Ralph Albert Blakelock (1996) by Abraham Davidson & R.A. Blakelock; A Checklist of Painters c. 1200-1994 Represented in the Witt Library (1995) by the Witt Library & Courtauld Institute of Art, London; The American Painting Collection of the Sheldon Memorial Art Gallery (1988) by Norman Geske & Karen Janovy; The Society of Independent Artists: Exhibition Records 1917-1944 (1984) by Clark Marlor; and the Directory to the Bicentennial Inventory of Paintings (1976) by the National Collection of Fine Arts.